Winemaker’s Notes: The wine displays the true character of a Chapoutier wine, it lets the terroir speak and define the wine. It is a blockbuster, full-bodied and loaded with flavor. The granite and schist soils coupled with 40-60 year old vines yield a truly expressive wine. The fruits of plum and dried raspberry dominate with spice and mineral notes. Hints of wet slate, mocha, and a hint of herbs mark the lingering finish. 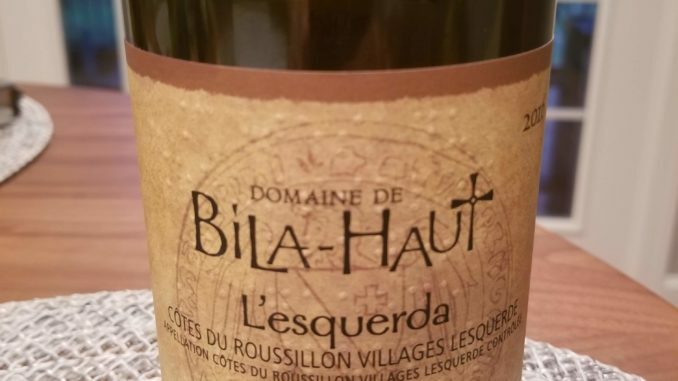 My Review: I’ve had several wines from Michel Chapoutier in the last few years, and while I’ve generally enjoyed them, I’ve struggled to decide where they fit for me – are they nicer wines to be opened for a special occasion or something you open on a Tuesday after a long day of work? This time I decided to go take the Tuesday approach (though, to be fair, I did open the wine on a Saturday). In the glass the wine was a medium red color, and on the nose I picked up aromas of dried raspberry and spice. In the mouth the wine was light-bodied for me, and very sippable, with the dried raspberry and spice aromas being joined by flavors of herbs and wet stone. My wife and I paired the wine with some turkey chili that we let simmer in the slow cooker all day, and the flavor pairing was nice – the body paired well with the bold flavors of the chili, and the spice and dried berry flavors were a nice contrast to the smokier flavors of the food. I liked this wine because of how approachable it is. You could pair it with a bunch of different foods and it would hold up well, though I think some sharp cheeses and cured meats would maybe be an ideal pairing. For $28 it’s a good value; you can enjoy this any day of the week and for just about any occasion. No need to wait.